A reconnaissance aircraft is a manned or unmanned military aircraft designed, or adapted, to carry out aerial reconnaissance. Their roles are to collect imagery intelligence, signals intelligence, and measurement and signature intelligence. During the Napoleonic Wars and Franco-Prussian War, balloons were used for aerial reconnaissance by the French. In World War I, aircraft were deployed during the early phases in reconnaissance roles (eyes of the army) to aid ground forces. Aerial reconnaissance was mostly carried out by versions of standard fighters and bombers equipped with cameras. 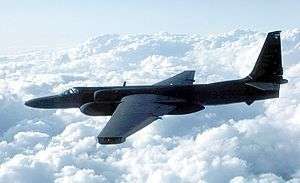 After World War II and during the Cold War, the United States developed several dedicated reconnaissance designs, including the U-2 and the SR-71, to deal with the nuclear threat from the Soviet Union. Today, much of the strategic role has passed over to satellites, and the tactical role to unmanned aerial vehicles. This was proven by the successful use by Israel and by the Desert Storm operation by the United States. Bonnier Corporation (January 1919). Popular Science. Bonnier Corporation. pp. 18–. ISSN 0161-7370. "Army-Lockheed YO-3A Silent Airplane in Vietnam"